According to the XII Five Year Plan, higher education in India needs to be aligned with global standards. Capacity has to be created for an additional two million students from the eligible age cohort. The Ministry of HRD, Govt. of India has set targets to achieve goals for higher education in India, as envisaged in the XII Five Year Plan. Rashtriya Uchchatar Shiksha Abhiyan (RUSA) a Centrally Sponsored Scheme (CSS), launched in 2013 aims at providing strategic funding to eligible higher education institutions. It places great emphasis on improving access to education, with an overall objective to improve the Gross Enrollment Ratio by 2020. The scheme is based on key principles such as performance-based funding, incentivizing performing institutions and decision making through clearly defined norms. RUSA aims to provide greater autonomy to universities as well as colleges with a sharp focus on equity-based development, and improvement in teaching-learning quality and research. To achieve these objectives, the Technical Education Quality Improvement Programme (TEQIP) was launched as a long-term programme of about 10-12 years duration to be implemented in three phases for the transformation of the Technical Education System with assistance from the World Bank. The first phase (TEQIP-I) commenced in March 2003 and ended in 2009 and the second phase (TEOIP-II) commenced in 2009 and ended in March 2017. In continuation with its efforts the third project phase, TEQIP-III aims to improve the quality of education through policy, academic and management practices in engineering institutions with a special focus on the Low Income States and the Special Category States. The Indian Institutes of Management (IIMs) have been entrusted with the responsibility of conducting Professional Development Trainings (PDTs) The broad aim is to enhance the management, governance and leadership aspects of technical education. The target audience of the PDTs are Senior Faculty members from recognized engineering colleges across the country. 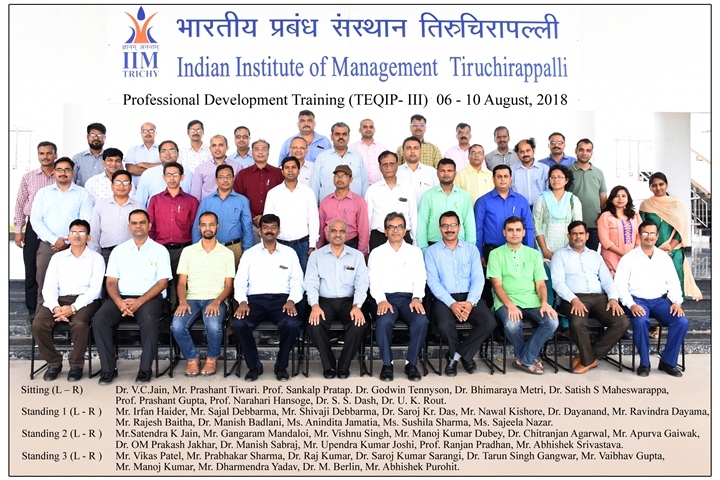 The Indian Institute of Management Tiruchirappalli is honoured to be part of this ambitious vision for India and welcomes you to the Professional Development Training (PDT) for Senior Faculty. PDT for Senior Faculty is a five-day residential programme designed for Dean/HoD/ Placement in-charge/Training and Placement Officers/Entrepreneurship Cell in-charge or similar level faculty members. The aim of this programme is to build capabilities in academic leadership.